Have you ever woken up and wondered whether the terrifying dream you had the night before was actually a nightmare? Some nightmares can seem so real that we later wonder whether they occurred. In some cases, they may even leave us a little bit fearful or distressed. Nightmares are somewhat common and happen to almost everyone at some point in their life. Night terrors, on the other hand, are similar to nightmares but much less common and may require the care of a specialist. At this point, you may be wondering, what is a night terror? 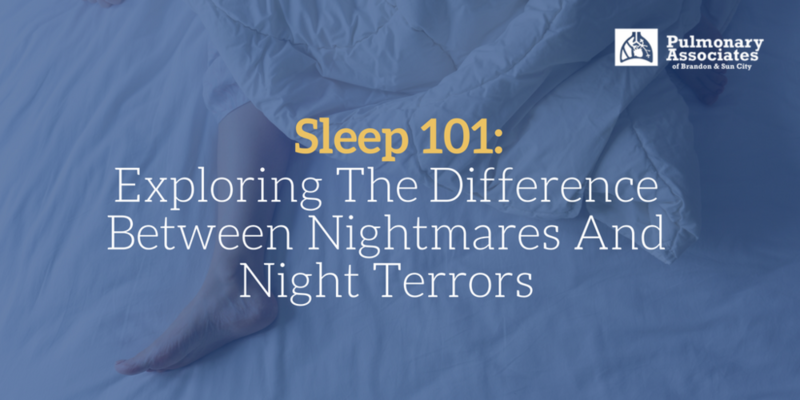 There is actually a big difference between nightmares and night terrors, and it’s easy to tell them apart once you know the symptoms of each, which we will discuss. In addition, we’ve also listed out some tips to help you determine when you should seek medical care for your night terrors. Night terrors, also known as sleep terrors, are a kind of parasomnia that induces terror or panic in the dreamer, causing them to scream, shout, sleepwalk, or thrash about violently. The condition, which is typically associated with post-traumatic stress disorder, can make it very hard to wake while dreaming, and typically the person remembers little of the dream in the morning. The condition is typically not considered dangerous, though it can evolve to become dangerous if the dreamer begins to show signs of aggression towards others or themselves. For some, it may cause a lot of distress or trouble sleeping, in which case it may also be advisable to seek medical care. Nightmares make people wake up from their dreams, whereas night terrors occur when people remain asleep. It is extremely difficult to wake up someone having a night terror and we don’t recommend that you do. Nightmares typically occur in the last half of the night “during REM sleep), while night terrors typically occur in the first half of the night (during non-REM sleep). Nightmares can cause people to thrash about, cry, kick, talk or even yell in their sleep; however, these actions rarely result in injury. Night terrors, on the other hand, can cause people to sit up in bed, scream, kick, sweat, stare with open eyes, run about, and even have aggressive behavior. It is important to understand the difference between nightmares and night terrors, so if you’re still unsure of what you’re experiencing, it’s safer to ask your physician. If the symptoms of your night terrors are persistently and negatively impacting your life, it is time to get help. In many cases, a sleep study can quickly identify the issue and our sleep specialists can recommend the best source for treatment. If you would like to learn more about our sleep studies and our sleep medicine, feel free to contact us today or book an appointment.